Today, for the first time ever, I am entering a pie in a bake-off. I've always wanted to enter food contests...baking ones, not eating ones (too many hot dogs or marshmallows stuffed in my mouth and I think I'd puke). But usually there is some lousy reason it doesn't work out - I find out too last minute or it's too expensive or it requires traveling or something. Actually, I did once try entering a recipe into the Pillsbury Bake-Off, but that didn't go very far, and there was no event where all applicants prepared their recipe and brought it to a judging panel to taste. That was only for the 100 finalists. When I read that chef Evan Kleiman of Good Food on KCRW (Los Angeles's NPR radio station) was hosting a pie contest, I got really excited. I'm not even a regular pie baker, though I'm also not new to pies. The contest rules said I could enter up to 4 pies, one for each of the 4 categories: fruit and nut; cream, custard, chiffon and mousse; savory; and interpretive pie, one that "defies categorization." I didn't want to overdo my first ever bake-off experience; one pie was plenty. I called up my mom, told her about this contest that was happening on a weekend when she happened to be visiting my sister and me in LA, and we spent a couple nights devising a delicious pie recipe to co-enter! We chose the mousse category. I won't divulge the recipe until after the contest is over (and only if the pie is not a complete failure or embarrassment to the pie-eating world), but I will say three ingredients that are featured in our pie: Chocolate, Peanut Butter, and Bananas. My mom and I each made the pie in our respective kitchens and then reconvened by phone to discuss any modifications we felt were necessary. Last night, with my mom in town, together under one roof, in my Los Angeles kitchen, we prepared the official pie entry. Mother-daughter activities are the best! 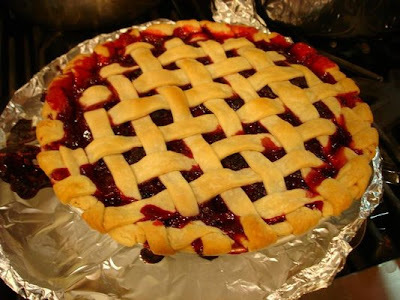 A berry pie I made a few years ago. Not the recipe I'm entering in this contest! I hear there are 150 pies entered. Holy moly that is a lot of pie for the judging panel to taste! I just hope all 150 pies aren't variations on the one my mom and I submitted, you know, with the same three featured flavors. That would be a big bummer. I'm going to think positively and remain calm! Speaking of judges, take a look at this incredible list of judges! And there you have it! I will keep you posted on my experience. I'm so excited just to take part in it! With my mom by my side co-entering, and my sister there for moral support (and to taste people's yummy pies), it's a Happy Go Marni family affair. Marni, it was so nice meeting you today! I'll have to link up to this post after I write about my day.